The 5th State Level People’s Health Assembly by Jan Swasthya Abhiyan Haryana has begun with this revolutionary song by Jatan Natya Kendra Haryana on September 09, 2018 at Rohtak, Haryana as part of preparations and mobilisation towards for NHA-3 Raipur and PHA-4 Savar, Bangladesh. “Time to Make Health and Healthcare a Fundamental Right is Now” was the central slogan of the assembly. 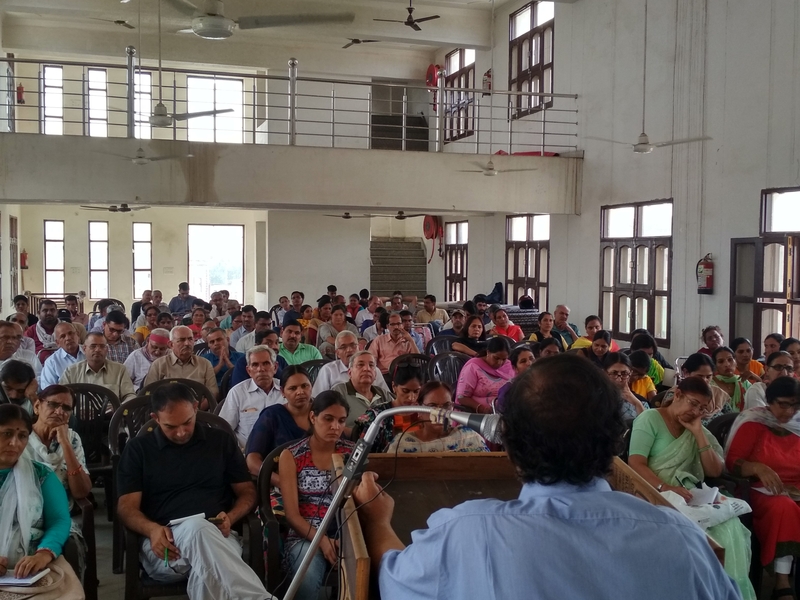 The Assembly have been attended by around 200 elected delegates from more than 25 organisations working on health and social issues in the state of Haryana. 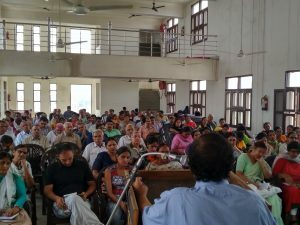 This assembly was presided jointly by Dr. R. S. Dahiya, President, Haryana Gyan Vigyan Samiti and Ms. Savita, General Secretary, AIDWA. State Convener Mr. Satnam Singh have welcomed the delegates and presented the background and perspective of health assembly and the journey of PHM at Global, National and Haryana state level 2000. Dr. Amit Sengupta, from the National Team of JSA have inaugurated the Assembly. In his inaugural speech Amit have covered the National, International as well the state level issues concerned with health of people. He had discussed how the Government of India is handing over the healthcare facilities to the private sector. How the health services are turning in to a high profitable business. He criticized the target based private health services. How the pro-business and pro-private healthcare schemes & policies have damaged the public healthcare structure. The issues concerning health education, gender and health, strengthening of public health sector, access to medicines, safe drinking water, nutritious food, clean air and a proper space to live have also been covered. He pointed out the need of strengthening of PHM movement across the globe and said that a strong health rights movement is the only option to achieve the goal of Health for All. Dr. Madhu Nagla, Professor Sociology, MD University Rohtak has spoken on Gender & Health. How the women of this so-called No.1 and developed state are suffering from anaemia and other illnesses. Their working conditions, lack of appropriate education and intervention by government is claiming women and children life. How maximum schemes for women have only limited to the reproductive health. The government policies never account their real health issues and needs. 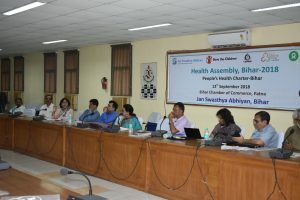 Dr. Ajay Chhikara (Surgeon) and Dr. Sonia Dahiya (Gynae) have discussed the issues related to implementation of health schemes, availability of health services in government health facilities. Both the doctors have also raised and discussed the challenges faced by the honest doctors and other health workers. Dr. Dinesh Khosla (Paediatrician), a private practitioner discussed the lack of proper health education. He also pointed out the need of dissemination of scientific information related to health to the masses. Then all constituent organizations have intervened in the discussion reiterating the need of collective efforts for health rights movement. Subhash-a RTI activist, Surekha & Sunita from ASHA, Sheelawati & Savita from AIDWA, Rishikesh from Viklang Adhikar Manch Haryana, Sandeep Singh from DYFI, Rahul from SAKSHAM Haryana, Kapoor Singh from BNKU, Saroj from MDM Haryana, Sohandass from HGVS/AIPSN, Shesshpal from BGVS, Suresh from MPHE, Shakuntala from Aanganwadi, Veena Malik from Himmat, Ramneek from Saptrang, Vikram from LT association have participated in the discussion. 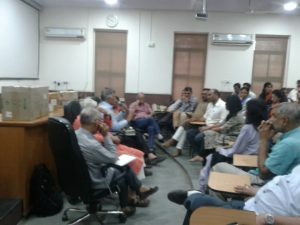 All these people have presented the report of interventions done by their respective organizations in health rights movement as part of JSA Haryana. 4. 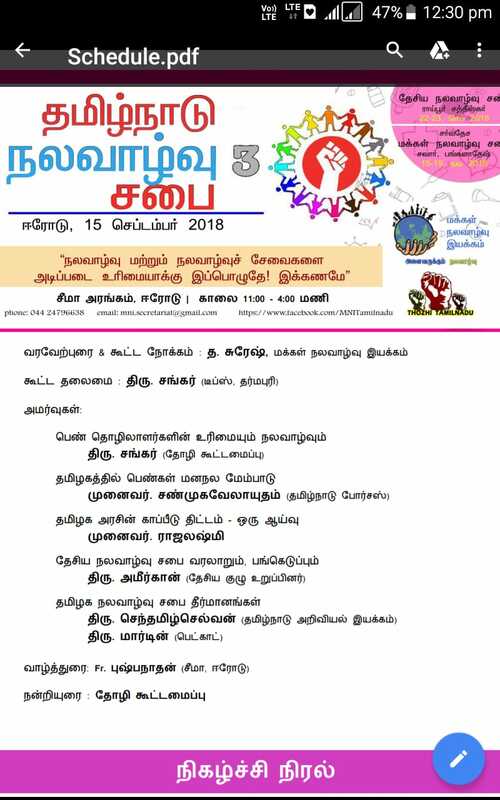 Publication of Booklets, Pamphlets, Brochures on various issues like Anaemia, Fever, Sanitation, Gender and Health, Working Conditions of Health Activists like ASHA. 5. 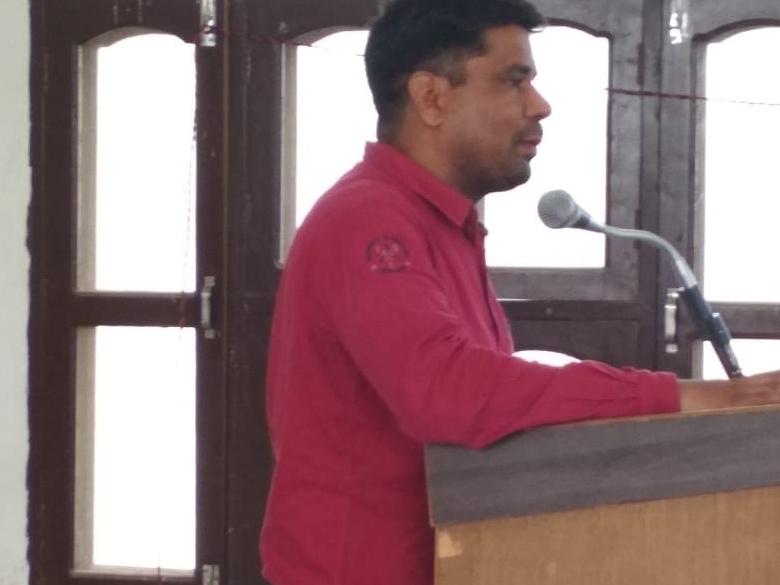 Seminars on various issues like Women & Health (Rohtak 1 Seminar), Food Safety (Jind 2 seminar), Strengthening of Public Health Sector (Hisar 3 seminar). 7. Agitation & Demonstrations for availability of proper facilities like medicines and other services at CHC, PHC level etc. 1. 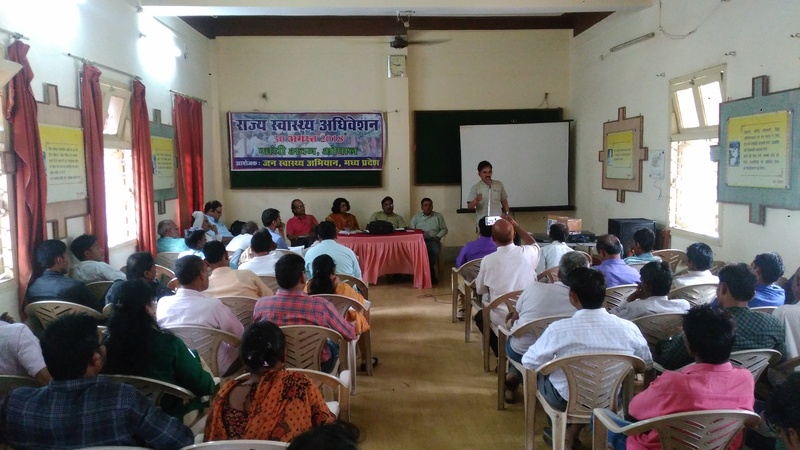 Formation Village Level Committees (2 Village per District) as a pilot. 2. Publication of Two Posters (Fever, Anaemia), Two Booklets (Women Health, Health Status of Haryana) and One Book comprising of selected articles which have been published in our Magazine in last 9 years. 3. 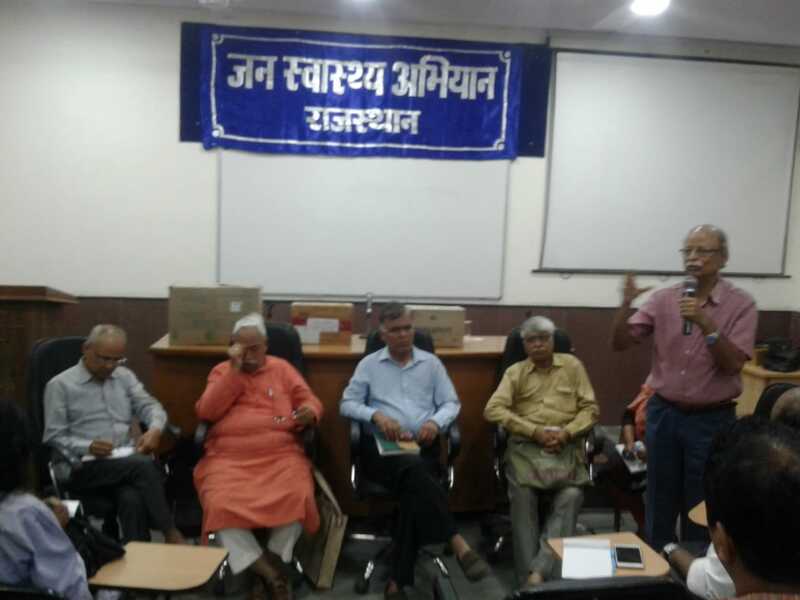 Inclusion of new organisations in the state JSA team.The strike and ongoing movement of different government employees’ associations of Haryana, specially, the MPHE, Nurses, Lab Technicians associations affected the attendance of Assembly. 4. Launch of Agitations for availability of health services (manpower, machines, buildings etc) at all levels. The Assembly have selected the 45 delegates to participate in NHA-3 to be held at Raipur on 22-23 September 2018. The Assembly ended with a play named “Ponga Panditon ki Jageh Jel Mein Hai” by Jatan Natya Kendra Haryana. 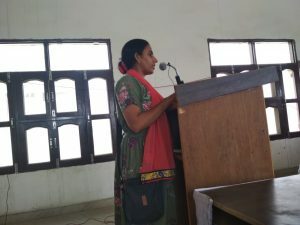 In the end Ms. Savita, General Secretary of AIDWA, presented the vote thanks on behalf of presidium. 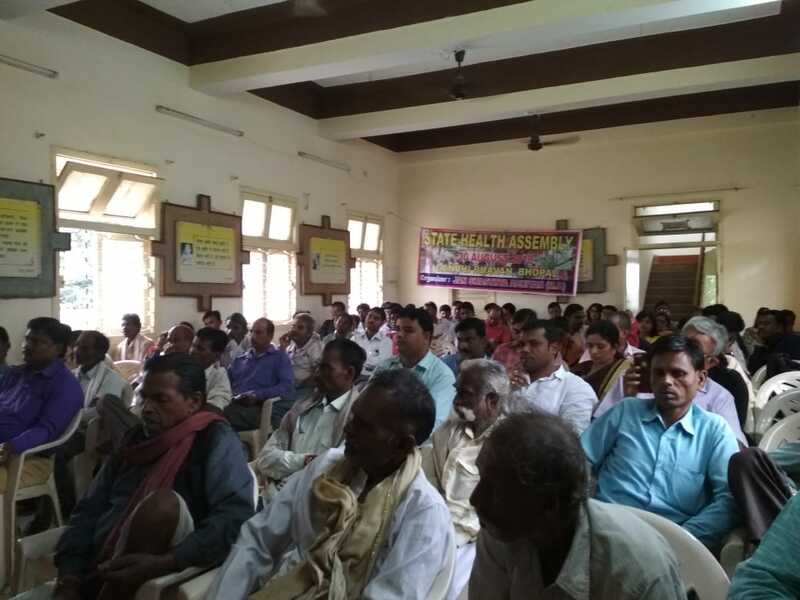 The state health assembly were organised at Gandhi Bhavan Bhopal on 30th August 2018, this was attended by around 90 participants from the 27 districts Shadol, Badwani, Datia, Tiakmgarh, Bhind, Vidisha, Khandwa, Mandla, Jabalpur, Damoh, Harda, Dhar, Jhabua, Singrauli, Alirajpur, Bhopal, Rajgarh, Sheopur, Chhatarpur, Katni, Satna, Chhindwara, Hoshangabad, Indore, Rewa, Anuppur and Narsingpur. 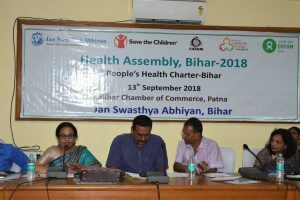 Assembly started with introduction of all the participants and inaugural lecture by one of the most active member of the Jan Swasthya Abhiyan Madhya Pradesh Mr S. R. Azad, he started with the revisiting the Alma Ata declaration 1978 of ‘ Health for All by 2000’ AD, to which India was also a signatory. It is almost two decades since the goal year has passed but there is no sign of the realization of the declaration. In fact, India is following the undesirable path of introducing the private sector in health care. After that he added major activities and campaign carried out by the state JSA like PIL filed in the case of privatisation of public health institution district hospital Alirajpurand Jobat CHC, Monitoring of National Health Mission, Botched eye surgery, Silicosis and many more. In the next session Dr. Anant Bhan who is working on the issue of medical ethics has delivered his speech on the subject “challenges in health sector in India with special focus on PPP, Insurance, and Privatization”. He said that health became a political agenda before the election year and government is focusing on the privatization or public private partnership in health care services. He also added that accessing health care services is leading cause of indebtedness. He shared some of the current government health schemes. Ayushman Bharat claims that 40% covered population is of SC/ST. This scheme provides for health insurance rather than direct health services. This has shifted the financing of health care from a public (tax-sourced) model to an insurance – based service. The government buys insurance on behalf of the beneficiary population from a third party (insurance agency) where the benefit cover is of ₹5 lakh with 1350 ‘cashless’ medical packages. There is no cap on the family size. There was a soft-launch of the scheme on the occasion of 15th August 2018, while the full-fledged operations are yet to be rolled out. A 24×7 helpline has also been launched. Source of funding is uncertain-while the central and state governments are to spend 60% and 40% respectively, but the corpus has been determined on the basis of the 2011 socio-economic caste census, and the population has been increasing at a steady rate ever since. Few stated like Odisha have refused to adopt the scheme since they have their own schemes with coverage upto 7 lakhs. 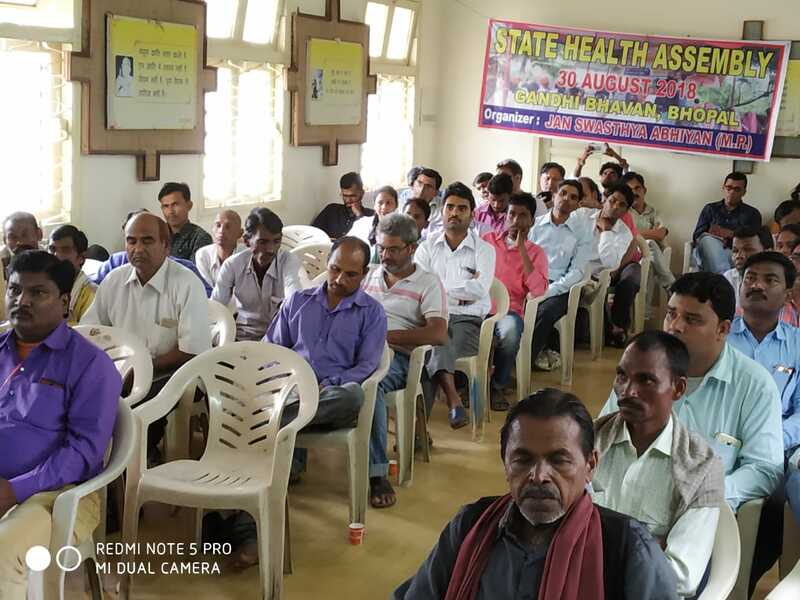 Ayushman Bharat focuses on in-patient treatment while OPD remains largely ignored. Out of pocket expenditure on health, especially primary health and post-operation palliative care pushes thousands of families into poverty and debt. The Medical and allopathic medicine lobby is adamant against bridging courses for nurses, ASHA workers, since it fears loss in revenue. Contrast this with the reluctance of certified doctors to go to rural and interior areas. Cases like the Johnson and Johnson hip replacement recall shows how the regulatory laws favour private agencies rather than people. In India, only those who have complained of complications are getting a corrective surgery, there is no direct compensation for all victims. 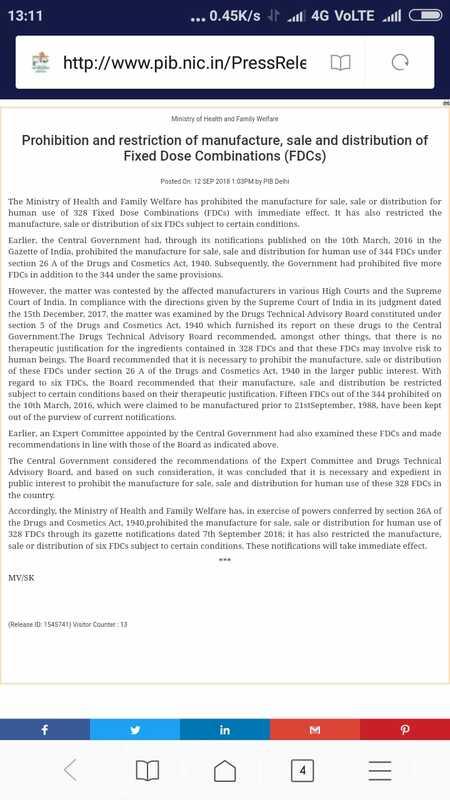 The recent controversy of the ban on oxytocin production, vaccination rows, is also issues of public health concern. Private hospitals get massive subsidies like land leases for a pittance because they are supposed to be working for social benefit. A particular ratio of beds is to be reserved for BPL patients, but these profit-driven entities will never work for social benefit since their driving objectives are contradictory. Dr. Anat Bhan also shared some of the good examples of privatisation of health services. 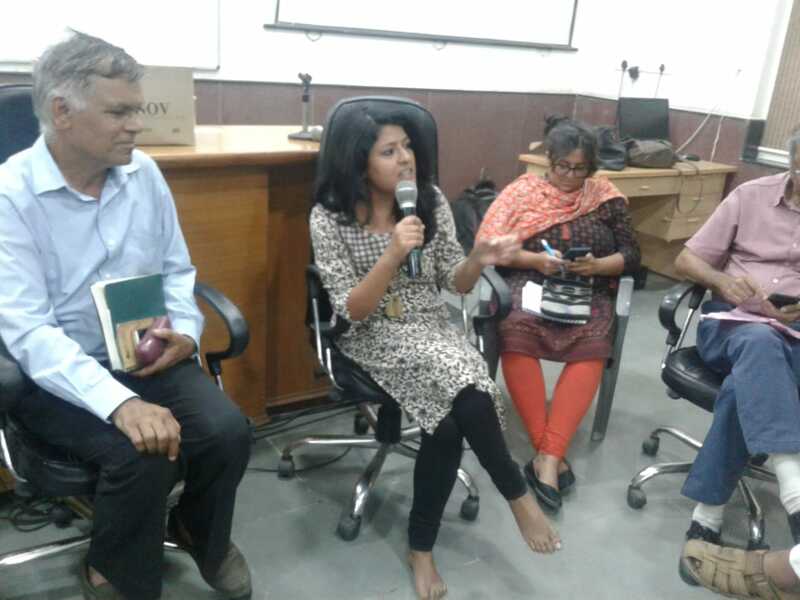 Mohalla clinics in Delhi, where private practitioners are incentivised to run a few hours of service, are a good example of how the existing private stakeholders can participate. Cross subsidising is an option where people who can afford pay more than those who can’t. Another issue raised was of sterilisation camps, malnutrition and consequent deaths, and their impact on marginalised communities. In the next session Mr. Aulya Nidhi talked about the Major Health Issue of Madhya Pradesh. He started with the explaining the basic ideology of Jan Swasthy Abhiyan is that JSA is a voluntary network, and all members are in agreement with the People’s Health Charter. Unethical clinical trials– Due to unethical clinical trials hundreds of victims died and thousands are suffering from severe adverseeffects. He added the recent example of Cases like the Johnson and Johnson hip replacement recall shows how the regulatory laws favour private agencies rather than people. In India, only those who have complained of complications are getting a corrective surgery, there is no direct compensation for all victims. Privatisation of health services and institutions – State Government is trying to privatise the health institutions. JSA intervene via public interest litigation (PIL) in one of the incidence of Alirajpur district hospital and CHC Joabt, where department had carried out an MoU with Deepak Foundation. Presently the process is on hold but we have to be very conscious about this type of steps and need to intervene timely. Health and wellness centre- Another important issue was of the newly proposed ‘Health and Wellness Centres’ replacing sub centres across the country, and alarmingly, vision documents talking about the updatation of sub centres but Madhya Pradesh health department is trying to convert PHCs in health & wellness centres. Due to this step the demand for two doctors at Primary health centre will be in grey area. Ethics in medical field- Ethics in medical education is one of the critical issue in th estate. VYAPAM scam is one the example but there are more practices in this fields to be addressed. Occupational Health issues- Occupational health is one of the major issues of Madhya Pradesh. Presently the issue of Silicosis identified in several districts of state like Alirajpur, Dhar, Jhabua, Shivpuri, Vidish, Panna, Chhatarpur, Mandsaur, Ratlam etc but till date government has not any poicy for the betterment of the workers at risks. He also address the issue of scrapping of 29 labour laws and their merger into 4 labour courts, and further impacts on issues of occupational health were discussed. Botched eye surgery – Faulty eye operations in government hospital were done in recent past. JSA took promptly steps in the matter and victims of the botched surgery get the compensation in the case of district hospital Badwani but in other places still things to do. Health impacts of thermal power plants – In the many thermal power projects are established and many more are in the line but there is lack of monitoring of environmental pollution and health impacts of these plants. Rajya Bimari Sahayata Nidhi – There is serious irregularities in the implementation of the scheme, JSA deal the various cases where concerned hospital demands more amount then sanctioned under the scheme. In one of the case of Indore Government has suspended the license of one of the hospital for demanding the more amounts. 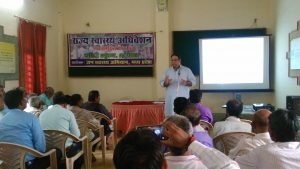 Mentoring Group on Community Action – MGCA is an official body of under the National Health Mission and many active members of Jan Swasthya Abhiyan are the members of MGCA. He requested to participated that like we should take this opportunity to raise our concerns. Apart from these issues he also speaks about the distribution of 10 lakh pairs of footwear to tendu patta worekrs allegedly contaminated with carcinogenic substances. His major concern in whole presentation was on the health policy is promoting the privatisation and health is became a ‘industry’. 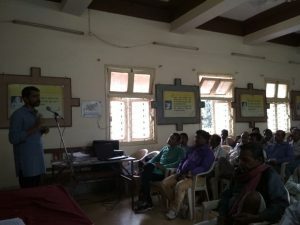 Food security and its impact on health- if food is being taken out of the PDS, and money is being transferred instead, it means the government would no longer need to buy food grains. Water is so inadequate in some areas in Jhabua that people are consuming contaminated water. There are no doctors or nurses at primary health centres. She spoke on maternal health as a collective investment of a community and not just in isolation. 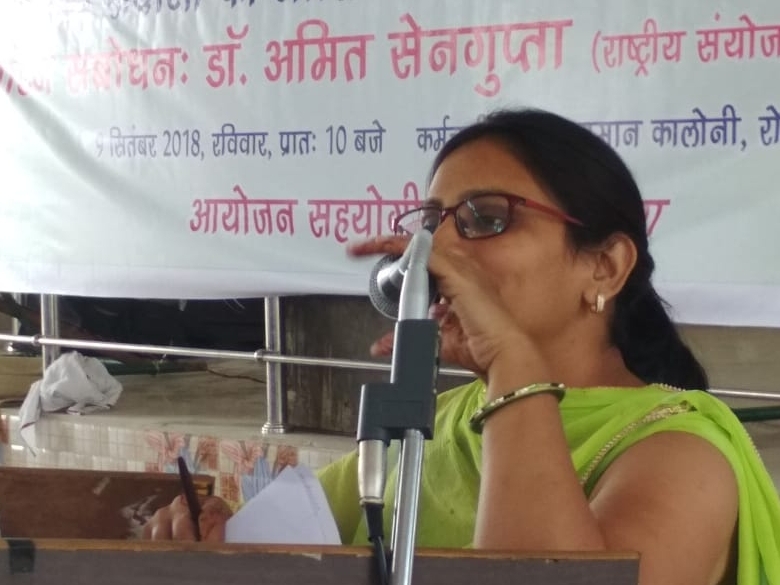 Sterilisation, particularly in unaware communities and the dangers associated with the same- for instance in Sheopur, out of 12 maternal death cases only one was investigated. 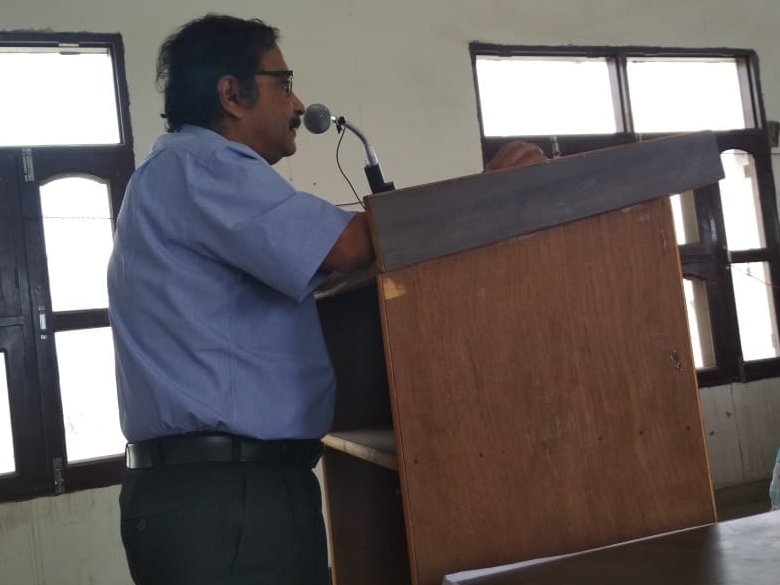 Ramji Roy from Datia spoke of the maternal health rights campaign, the quarterly magazine published by MHRC to inform people about issues relating to maternal health. Another shocking sterilisation camp case was of 66 operations happening in 1.5 hours, a complaint of which was forwarded to the State women’s commission. She spoke of domestic violence and its impact on women’s health, particularly psychological health, of which women unaware of their rights were victims of. He spokes about fly Ash causing air and water contamination on the environment and the health of the people living in the vicinity of the Moser Baer thermal power plant. 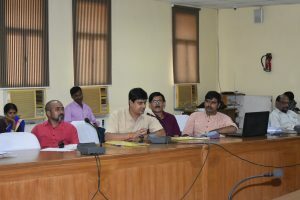 He described the contamination of the Khirna Nala and fly Ash getting drained in the Son River, causing health issues not only in people but also animals and farms. 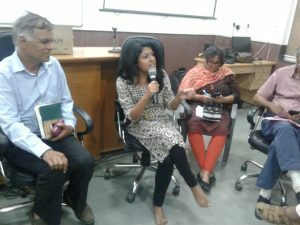 She raised issues on the role and functions of ASHA workers, lack of remuneration, dignity and their own health safety since they spend most of the time in contact with sick people. The perception of ASHA for the patients as being reprentatives of the government, and of the government as them being ordinary people, puts them in a difficult position to carry out duties and also get remuneration for same. ASHAs need access to better primary health infrastructure so that secondary and tertiary care can become easier in the system. Training material in English also posed a hurdle in areas where hindi is the predominant language. 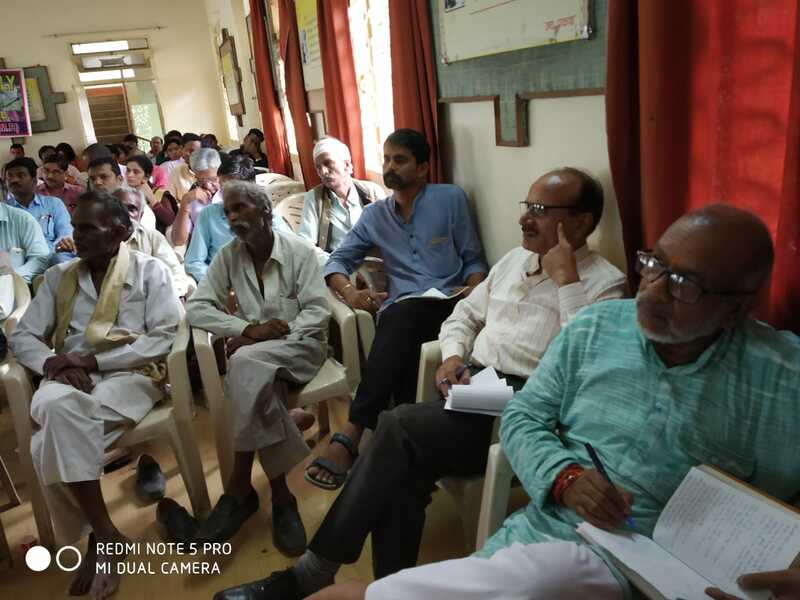 The role of Sochara, CPHE fellows collective as a network for cooperation, raised issues of ASHAs having to spend out of their pockets to provide patients access to services, and the role of MGCA members. 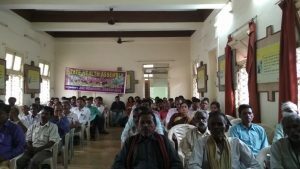 He spoke of the relation between the Ken Betwa link and the 12 villages near the Panna tiger reserve being in its submergence zone which would lose access to healthcare. The gatekeeper of the reserve does not allow ambulances to pass, which have to take a 100-km detour. These are places where vaccination hasn’t taken place since 4-5 months and PHCs function only on 15th August and 26th January. 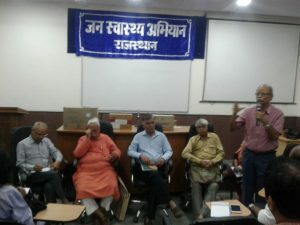 Heshared his own experience with the exploitation of the RBSY scheme and the exposure of which lead to the cancellation of the licence for the scheme of a major hospital in Indore. He spoke of the workers in mines and the role of medical norms which prevented the diagnosis and reporting of silicosis due to unrealistic conditions like symptoms needed to be visible since 8-10 years. The impact of mining activities was not only limited to people but also water and vegetables in the region. She spoke about the inaccessible PHCs during rainy season, lack of vaccination facilities, staff and diagnostic machines. Facilities that are supposed to be available at PHCs are not even available at the district hospital. In the case of child deaths, there was no audit or even committee or any information established. He spoke of the hazards of fly ash from the thermal power plants in districts. He threw light upon the attitude of the World Bank, role of PPPs and the overall impact of globalisation on the environment–loss of bees, decrease in medicinal plants, key species, issues with lax environmental laws and the futility of EIAs. The exclusion of locally available varieties of grains, vegetables and sources of nutrition from PDS and reducing the role of SHGs to only providing food has made the incidence of malnutrition worse. He recommended conducting the family food audit to monitor consumption, and also questioned the low expenditure on health in the budget despite 2.5% annual population growth rate. The relation between health and food security is crucial. Social audit, including health and food habit is essential. The mining districts are entitled to funds from the district mineral trust, commenced in 2010 to ensure that profits from mineral mining are shared with local stakeholders. 10% of the profit earned from mining minerals is to be used primarily for the health and education concerns of women and children. A corpus of ₹2000 crore was created, of which 580 crore were sanctioned and of which only 320 crore were used, and even that was used to build boundary walls and roads, and not for the communities as was the objective. Similar is the case with state mineral fund. 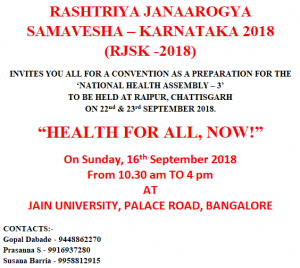 6 themes were designed to divide the members into focus groups to make recommendations regarding each issue to be presented at the national JSA convention in Raipur and to prepare peoples health charter for political parties. The following themes in health were decided upon where people from various places working on various issues of health would contribute. Members are expected to send suggestions for each theme by 10th Sept.
With the consent of all the members’ participation in NHA 3 was decided. Totally 130 participants from 33 districts are attending the National Health Assembly. Coordination will be done by the Rakesh Chandore and Ashish Pare. International health assembly will be organised at Dhaka, Bangladesh from 15th – 19th November 2018. Active members from each region can participate in this event. List will finalise later. PHM is organising IPHU at Dhaka before the international health assembly, where a week long diploma course will be conducted on the issues of national and international health concerns. It is also decided that the Amulya Nidhi and S.R. Azad will coordinate and do the follow up of all the decision taken in the assembly. Vote of thanks given by the Ashish Pare of Madhya Pradesh Vigyan Sabha, Bhopal. 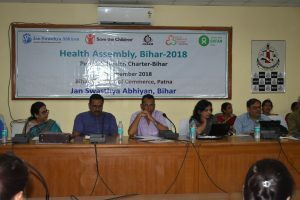 Jan Swasthya Abhiyan (JSA), Bihar organized Health Assembly Bihar-2018 on 13th September 2018 at Bihar Chamber of Commerce, Patna. 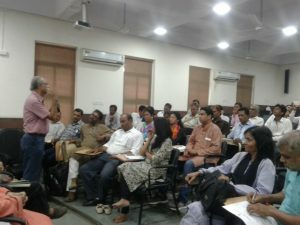 More than 100 participants from about 60 different organizations have participated in the programme. Ms Priyadarshini Trivedi, Population foundation of India (PFI) welcomes the guest and participants. Mr Rafay Eajaz Hussain, Save the Children shared the purpose and importance of the health assembly. He said in 1978, at the Alma‐Ata Conference declared “Health for All by the Year 2000” selecting Primary Health Care as the best tool to achieve it. The Alma-Ata declarations were given a silent and reticent burial. It was ensued by developing another international protocol -Millennium Development Goals in 2000 and set a target to achieve these Goals by 2015. Regrettably, these dreams never came true – not the least in India. Key speaker Dr Abhay Shukla, JSA said that the health, public health and democracy have the deep relationship if we want to create a welfare state. He also emphasized on the slash in the health budget by current government. He shared the nutrition status of country and Bihar. He said recently launched National Health Protection Scheme (NHPS) aims to cover almost half the population with publicly funded health insurance. The scheme is built and formulated around an interpretation of universal health coverage that reduces universal health care to health insurance coverage and that too for a proportion of the population. The private health insurance companies and health care providers are already expecting huge windfalls from NHPS. In parallel to this the government has also launched a programme for the provision of Comprehensive Primary Health Care (CPHC). 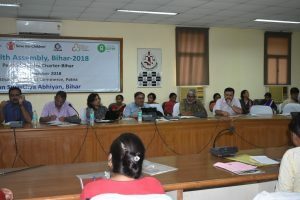 This programme envisages the strengthening of 1.5 lakh existing sub centres and all primary health centres into Health and Wellness Centres (HWC) that would deliver a broader package of preventive, primitive, curative and rehabilitative services delivered close to communities by health care providers. However, for its successful implementation, the system has to commit to more finances, a regular well trained considerably expanded work force and a very robust continuity of care arrangements with a strengthened secondary and tertiary healthcare. 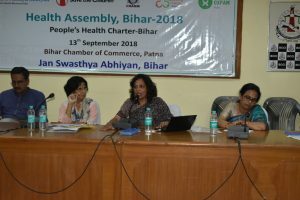 Both these components under the Ayushman Bharat have a significant involvement of the private sector, indicating a shift from public provisioning of health towards privatisation. These developments are altering the policy and governance landscape in India, which would have far reaching implications especially in the area of health and healthcare. He said “we don’t need health card we need health right”. Dr Nilangini, SAHAJ shared experience of data driven advocacy for gender equality. Dr Madhumita Chatterjee, PMCH, Mr Pratiush Prakash, OXFAM, Mr Sandip Ojha, C3, Ms Priyadarshini Trivedi, PFI, Mr Saurabh Kumar, Action Aid, Mr Rupesh Kumar, Right to Food, Ms Sushila & Nivedita Jha, Bihar Mahila Samaj and others has also shared their views. 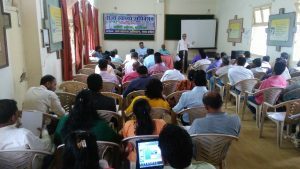 The Assam State Chapter of the Jan Swasthya Abhiyan (JSA) organised its 3rd. State level Convention on September 9 last at Bhagawati Prasad Baruah Bhavan in Guwahati. 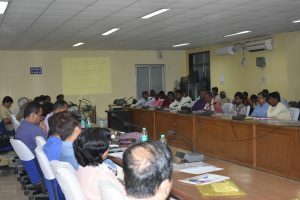 The Convention was jointly organised by the Ellora Vigyan Mancha, Gyan Vigyan Samiti, Assam and Medical and Sales Reprentatives’ Union, popularly known as CRU(NER). However, representatives from several other organisations also participated. These organisations were : the Kasturba Gandhi Memorial National Trust, Assam Science Society, North East Network, Assam Network for Positive People, Piramal Foundation, Doctor’s for You, ASHA and Anganwari Workers ‘ Union, AIDWA, Nursing Home Employees’ Union, MISSAT, Karunadhara, etc. Few students and Faculty members from IIT, Guwahati and TISS, Guwahati Campus also participated in the Convention. The well attended Convention was co-chaired by Dr. Chandra Mohan Sarma,the President of Ellora Vigyan Mancha and Ms.Madhuri Medhi, former President of GVS, Assam. The Convention was attended and addressed by Dr. T. Sundararaman, one of the National Convenors of the JSA. The Draft of the Convention was placed by JSA’s State Convenor Bijan Das. In his report, Das briefly touched the history of formation of the JSA in Assam in July 2000 and the present state of affairs of the Network. While dealing with the Health Policies of the successive governments, he presented a worrisome picture of the Assam’s Health Sector and stressed the need to consolidate and expand the broad platform of the movements for ‘Right to Health and Healthcare’. Dr. Sundararaman, in his speech, explained the broad contour and character of the JSA which forms the Regional Circle of the World People’s Health Movement. He added, the NHA-3 aims to address the urgent need to defend public health systems and prevent rampant privatisation of public healthcare services. The overarching theme for the NHA-3 would be “The time to make health and healthcare a fundamental right now”, Sundararaman stated. 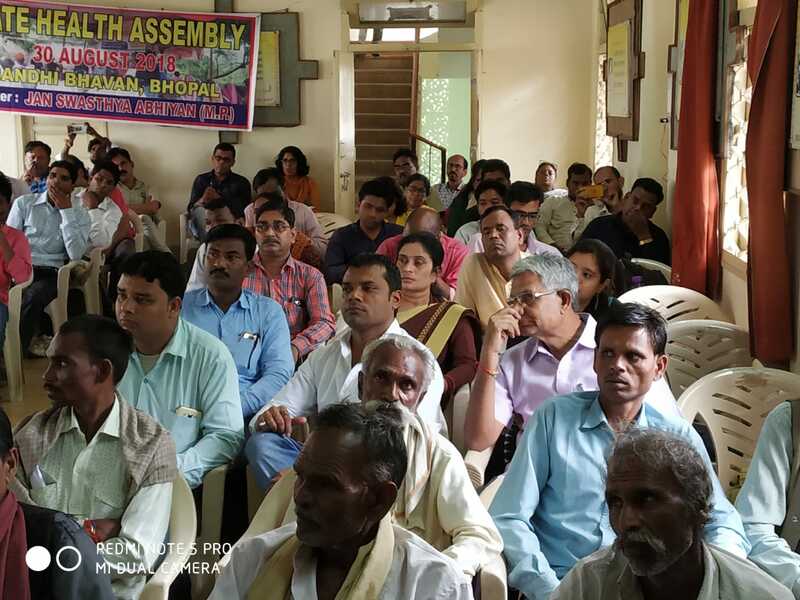 At the end of the two-day programmes, the assembly shall adopt a People’s Health Manifesto which will be shared with all the political parties and policy makers with the aim of realising health and healthcare as a fundamental right. 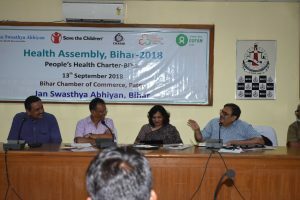 The NHA-3 at Raipur would be followed by the World People’s Health Assembly at Dhaka from 15 November next, Sundararaman added. The Convention was also addressed by Northeast Coordinator of the JSA, Isfaqur Rahman. The Convention elected a New State Committee of the JSA in Assam with Dr. Anil Choudhury as President, Dr. Anita Roy Saha as Working President and Rahul Purakayastha as its Secretary. The Committee will be broad-based with the inclusion of individuals and representatives from various organisations working in the field of health and healthcare rights. A list of around 40 persons was also prepared for participation in the NHA-3 at Raipur scheduled to be held on 22-23 September next. I am glad to inform you that we are going to hold ‘A.P. 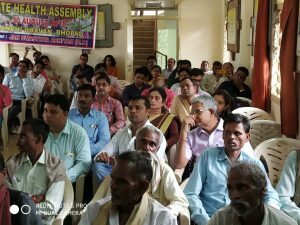 Peoples Health Assembly’ on 16th September at Dr. J. Sesha Reddy Vignana Kendram, Nellore. I am sure, many of the seniors here knew Dr. J. Sesha Reddy. However, for the sake of others, I would briefly introduce Dr. JS,as he is fondly remembered. Dr.JS was one of the founders of Peoples Poly Clinic (PPC), Nellore. He was also one of the founder leaders of Peoples Science Movement and Peoples Health Movement in Andhra Pradesh. He had been a dedicated peoples doctor, passionate health activist and inspiring leader till he breathed his last in June 2008. Since then, we are organising annual seminars in his memory, to highlight contemporary issues in peoples health. This year happens to be the tenth death anniversary year of Dr. JS. Hence, we planned to combine Dr. JS Memorial 10th annual seminar with AP Peoples Health Assembly. Indranil and Rich accepted our invitation to attend as guests. Gargeya helped in coordinating with them. 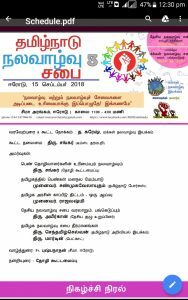 Gargeya too is supposed to attend, but since he is occupied with NPHA coordination, he expressed his inability to attend. 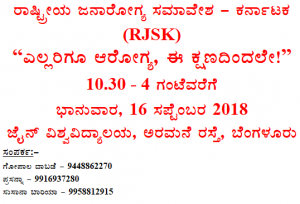 Indranil will speak on ‘NHPS – Peoples money & Private Profits’ and Rich on ‘JSA-PBI National Campaign on Strengthening Public Provisioning of Healthcare in India’. 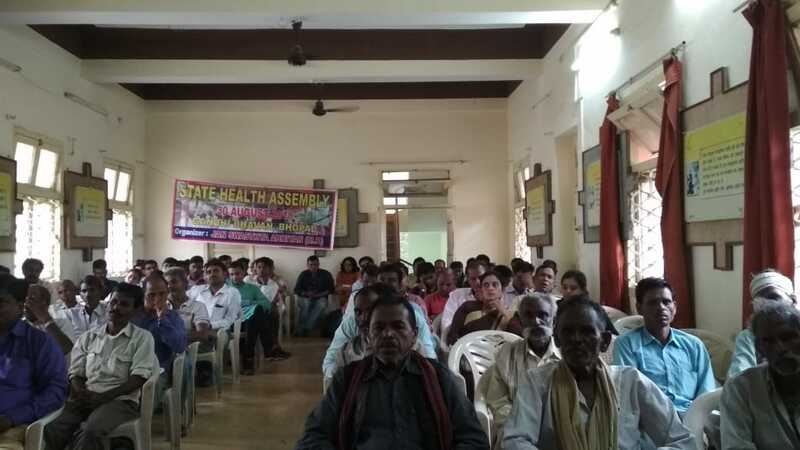 As part of Peoples Health Assembly, delegates from across the state will reflect upon the plight of health care services in their respective division/town/village. There is also going to be a discussion on Chronic Kidney Diseases, as there has been a rise in the incidence of CKD in certain areasof AP. I am also glad to inform you that we are releasing the Telugu translation of ‘Dissenting Diagnosis’ on this occasion. 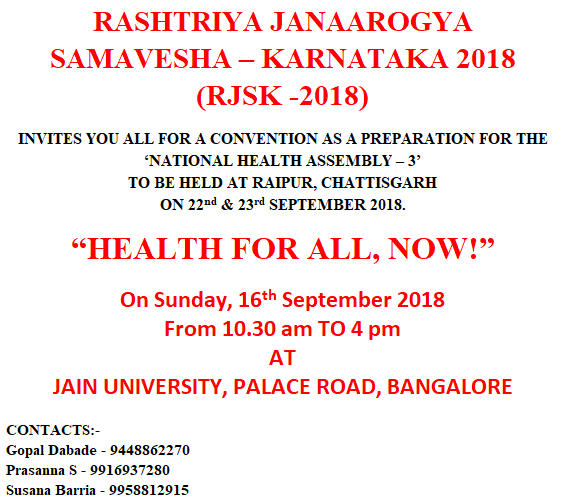 We are only 10 days away from the third National Health Assembly scheduled in Raipur on 22nd – 23rd September 2018. Nearly 1000 participants from across the country have confirmed their participation. Most states have given their participation and few are yet to give their confirmations on the arrival dates etc. Kindly send the participation list, arrival, and departure dates and timings. States are requested to provide details on specific requirements if any on differently-abled persons, senior citizens, women in need of childcare, specific dietary requirements. It will help us in arranging logistics. When preparing to come please get extra bedsheet and personal items like soap. States who want to get state banners and flex, please note that plastic flex is banned in the state. Kindly get the bio-degradable ones. We have since received updates from various states for their respective state health assemblies. Various state chapters have also done district level mobilisation and also had their state level assemblies. You can find the state reports under State JSAs section. The mobilisation and the state level assemblies have been very vibrant and can be viewed here. 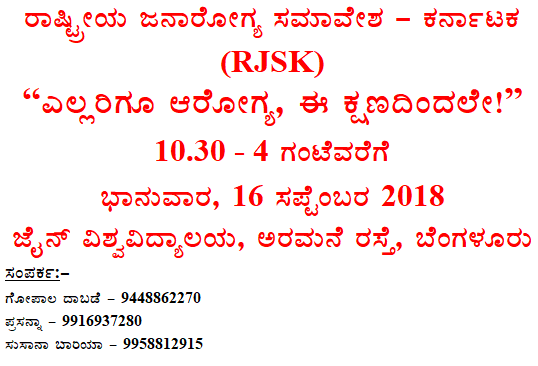 The state assemblies of Karnataka is on 16th September and of Tamil Nadu is on 15th September. The program that has evolved is very exciting and it can be viewed here. Hoping to see you all in Raipur.